Sexual reproduction occurs when the sperm from the male parent fertilizes an egg from the female parent, producing an offspring that is genetically different from both parents. Mottled ducks (Anas fulvigula) lay their eggs in grass nests near to the ground, usually close by water. 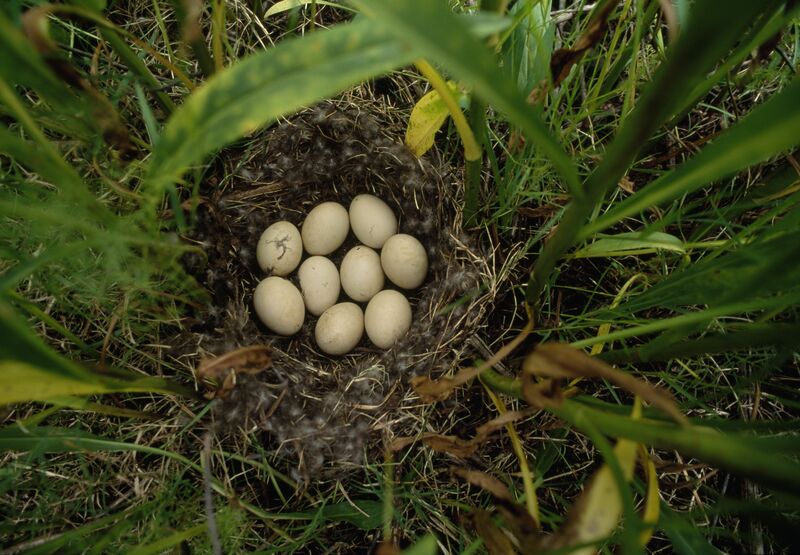 Though this nest looks quite full with nine eggs, a clutch of mottled duck eggs can contain as many as twelve or thirteen eggs. Organisms are genetically diverse because of sexual reproduction. Sexual reproduction begins with sperm and egg cells, which are produced through a process called meiosis. These cells are referred to as haploid because they contain half of the number of chromosomes as the parent. In sexual reproduction, a haploid sperm from the male parent fertilizes the haploid egg from the female parent to produce what is called a diploid zygote. Zygote is the technical term for a fertilized egg. The diploid number of chromosomes is the normal number of chromosomes found in all of the regular cells of an organism. The zygote grows and develops into a new organism. It is genetically different from both parents because half of its chromosomes came from the male parent and half of the chromosomes came from the female parent, giving it a unique combination of genes. Sexual reproduction occurs in both plants and animals. Among plants it is used most notably by flowering plants. The pollen grains of flowers contain the sperm. The vase-shaped female reproductive organ in the base of the flower, or the pistil, contains the eggs. When the pollen grains land on top of the pistil, they make a pathway to the eggs. Each zygote develops into a seed that, when in soil, can grow into a new plant. Sexual reproduction occurs in a variety of ways in animals. In some species, such as fish, the male releases sperm over the eggs after the female has laid them. In other species, such as birds and most mammals—including human beings—the male releases sperm into the female reproductive tract. Some animals, such as earthworms, are hermaphroditic—they possess male and female sexual organs and can produce both sperm and eggs. They mate with other earthworms, however, to produce genetically diverse worms. organism with both male and female reproductive organs. seed-bearing female reproductive organ of a flower, consisting of an ovary, style (tube that delivers pollen to the ovary), and stigma (which receives pollen).